- Forests overlooked in regulating climate? 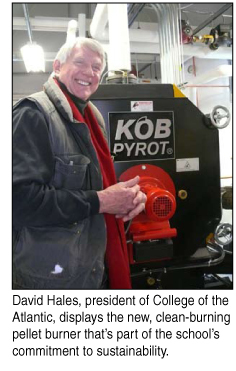 College of the Atlantic (COA) in Bar Harbor, Maine, just fired up its first-in-the-nation, carbon-neutral wood pellet boiler that provides clean heat to four buildings, or one-fifth of the campus. The KOB wood pellet boiler, built by Veissmann of Austria, is controlled by a highly sensitive computer system. More than a dozen sensors and motors continually monitor temperatures, as well as the level of oxygen and pellets in the mix, said school officials. “The combustion technology is very advanced, the fuel/air mixture is the perfect mixture. There’s constant monitoring, so it is high-efficiency and clean burning,” said Burkhard Fink, who installed the half-million BtU boiler. Emissions are kept to a minimum and the white substance spiralling from the chimney is steam, not smoke, he added. In Europe, where the technology evolved, such clean-burning systems are required by law, said Fink. “The quality of emissions can compare to the cleanest of gas boilers.” The boiler’s renewable fuel is compressed sawdust pellets, a byproduct of an Aroostook County sawmill. The boiler is one element of a sustainable complex of student housing completed on COA’s campus last summer, the college’s first major building project since it became carbon neutral in 2007 and pledged to move to total reliance on renewable energy sources by 2015. The three new student residences and a converted campus center that make up the Kathryn W. Davis Student Residence Village also feature a foot of cellulose insulation created from shredded newspapers, the use of gray water from showers to preheat hot water, an energy recovery central ventilation unit preheating fresh air in the buildings and composting toilets. All electricity at COA comes from renewable hydropower and all new buildings have recycling containers on every floor, all kitchens have composting bins. Light-emitting diodes and compact fluorescent bulbs are used for lighting All appliances are energy-efficient, paints are non-toxic, “green” cleaning materials are preferred, and furniture is made of sustainably harvested regional wood. The Midcoast Fishermen’s Association, based in Port Clyde, Maine, filed suit against the federal government February 26, hoping to ban industrial herring trawlers from fishing areas identified as spawning grounds for groundfish. Represented by the public interest law firm Earthjustice, papers filed in federal court by the fishermen’s group charged that herring ships are catching haddock and other groundfish stocks in their nets, and that New England Fishery Management Council (NEFMC) has reneged on a promise to curtail their activites. Fleming adds that in November 2007, the New England Fishery Management Council voted to make herring industry reform a priority and initiated a new amendment to the herring fishery management plan. In the next two years, NEFMC indicated a willingness to curtail mid-water trawling in spawning areas. But at a recent meeting February 9, the council chose not to consider its herring subcommittee’s recommendation. Midwater trawlers were initially banned from groundfish-closed areas in 1994. But in 1998 federal regulators decided to re-open these areas to trawlers, based on an assumption that the herring ships would catch little or no groundfish in their nets. In a 2004 enforcement sweep, personnel from the Maine Marine Patrol and Massachusetts Environmental Police caught midwater herring trawlers illegally trying to land thousands of pounds of juvenile haddock and hake mixed with their herring catch. In recent months, government monitors have documented other instances where thousands of pounds of haddock were caught and discarded by the trawlers. Whale researchers spotted 44 right whales in one area of the Gulf of Maine this winter, leading scientists to believe they have identified a wintering ground for the endangered whales, and possibly a breeding ground. Scientists from the National Oceanic and Atmospheric Administration’s Northeast Fisheries Science Center in Woods Hole, Massachusetts, spotted the whales during an aerial survey in the Jordan Basin area in late December, 70 miles south of Bar Harbor, Maine. The United States Minerals Management Service (MMS) released the Final Environmental Impact Statement (FEIS) January 19 for the 130-turbine Cape Wind offshore wind energy project in Nantucket Sound. The FEIS concluded the project’s environmental benefits would outweigh the potential negative impacts and established the requirements intended to minimize those impacts. The FEIS caps seven years of state and federal review. A final decision by the U.S. Secretary of Interior will end the permitting process. Forests overlooked in regulating climate? Researchers at the University of New Hampshire have released a study that shows forests may influence the earth’s climate in more important ways than previously noted. The study was published in the Proceedings of the National Academy of Sciences in November. Scientists led by a team at the UNH said they stumbled upon the importance of nitrogen in foliage while poring over six years’ worth of data collected from research sites across North America. Scott Ollinger, a professor at the UNH Institute for the Study of Earth, Oceans, and Space and the department of Natural Resources and the Environment, and his colleagues, discovered that, of the total amount of sunlight that falls on forests, the fraction that gets reflected back to space is directly related to levels of nitrogen in their foliage. When sunlight is reflected back to space, it doesn’t influence the earth’s temperature. This new discovery suggests that nitrogen plays an important role in the earth’s climate system never before considered. The team included Ollinger and UNH colleagues Andrew Richardson, Mary Martin, Dave Hollinger, Steve Frolking, and others. Researchers say the newly discovered link adds an interesting new twist to understanding the climate system and raises intriguing questions about the underlying nature of ecosystem–climate interactions. Maine restaurants, retail outlets and towns rallied to push lobster sales this winter when prices to harvesters dropped to around $2 a pound. In Stonington, a special event was held at which 5,000 pounds of lobster were sold at $3.50 a pound. In Georgetown, 3,400 lobsters were sold at $4 a pound and in Boothbay Harbor, nearly 7,000 lobsters were sold at $4 each. “It’s humanitarian to say we’re doing it to help the lobstermen,” said Brian Ross, a Bangor chef who started a nonprofit website with lobster recipes to help boost sales. “But you know what? Lobster tastes good." Hannaford Supermarkets promoted lobster heavily and sold unprecedented amounts of the crustaceans to Maine residents in November and December. Whether these efforts will pay off long-term to help the embattled industry remains to be seen because some lobster harvesters are predicting many will drop out of the fishery if prices don’t rise by spring. High fuel and bait prices, coincided with low lobster prices last season at the same time demand plummeted. Bill Adler, president of the Massachusetts Lobstermen’s Association, said he’s heard from harvesters that many are considering getting out of the business completely. The Massachusetts Office of Coastal Zone Management was among several state, local and federal environmental officials recently honored by the federal government for a project that restored 65 acres of coastal wetlands in Dennis. Coastal America, a collective of federal agencies that support wetlands and aquatic habitat restoration, awarded leaders of the Sesuit Creek Salt Marsh project the 2008 Coastal America Partnership Award for outstanding efforts to restore and protect the coastal environment. Coastal America comprises 16 federal agencies, including the Executive Office of the President, the Environmental Protection Agency and the Department of Energy. publications please visit the Gulf of Maine Council on the Marine Environment.